Considering it’s so close to Britain and has one of France’s most gorgeous landscapes, it would be a shame if you missed out on Brittany during your next trip across the channel. Brittany is located on the end of France’s ‘right arm’ reaching into the Atlantic. The Main cities in the region are Nantes, Rennes and Brest, which are all places worth visiting for their largely ungentrified, rustic-french feel, but for some peace, quiet and beautiful surroundings, you could engage in some island-hopping. One of the most highly recommended places toc heck out is the Île-de-Bréhat archipelago. 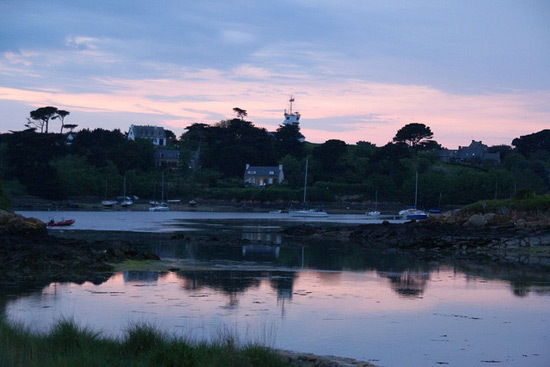 It’s accessible by a ferry service from the northern coast of Brittany, and well worth the trip. Its pink granite rocks and unique vegetation will make for a lovely daytime stroll. On the other side of Brittany, a few kilometers off the coast from the city of Lorient, lies the island of Groix. Probably the most tourist-friendly part of the island are the sandy, inviting beaches on its south coast, but those with a geological bent might find it interesting that there is a high number of different minerals to be found on the island. For a rewarding walking trip culminating in a village pub with a local pale ale, you could take a trip to the Crozon peninsula just south of Brest. There are nice beaches to lounge about on, but there are about 25 miles of marked trails across the peninsula. During these walks, you can admire the tiny villages and the multi-faceted flora unique to Crozon. To explore Brittany and its many beautiful islands, you can take a P&O Ferry from Dover to Calais, from where you can take a train to Brest station (around seven hours).